Revolution 9 wasn't enough for you? 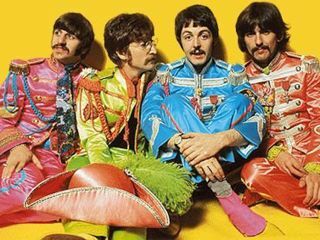 Well, get ready for this: Paul McCartney says the world is finally ready to hear Carnival Of Light, a 14-minute experimental track The Beatles recorded in 1967 but never released. The band played the recording only once - at an electronic festival in London that same year. Carnival Of Light reportedly includes blasts of distorted guitar, organ sounds, gargling and shouts of "Barcelona!" and "Are you all right?" from McCartney and John Lennon. In an interview with BBC Radio 4's Front Row, Paul McCartney confirmed that he has the master tape and that "the time is right for it to get its moment." Usually regarded as the softer, more conventional side of the greatest songwriting team in history, McCartney called the shots for Carnival Of Light. Commissioned to create the piece by friend Barry Miles for the Million Volt Light And Sound Rave show, McCartney interrupted the making of the song Penny Lane on 5 January 1967 and asked the other Beatles, "Would you mind giving me 10 minutes? "All I want you to do is just wander round all of the stuff and bang it, shout, play it. Hit a drum, wander to the piano, hit a few notes...and then we put a bit of echo on it. It doesn't need to make any sense." Apparently it didn't to the other Beatles, who deemed the track too adventurous to release. But McCartney never lost his enthusiasm for the piece - "I like it because it's The Beatles free, going off piste" - and is now determined to issue the recording. For this, he needs permission from Ringo Starr, Yoko Ono and Olivia Harrison. The world almost got to hear Carnival Of Light in 1996 when the remaining Beatles worked on the comprehensive Anthology compilation. "We were listening to everything we'd every recorded," said McCartney. "I said it would be great to put this on because it would show we were working with really avant-garde stuff. But it was vetoed. The guys didn't like the idea, like 'this is rubbish.'" The strongest naysayer at that time might have been Harrison, who, according to McCartney, called the sonic experimentation "'avant-garde a clue." We at MusicRadar find it oddly fascinating that the other Beatles had such strong negative reactions to Carnival Of Light - Lennon, in particular, who in 1968 would assemble the controversial Revolution 9 and argue that free-form music was the direction The Beatles should take. Speaking of free-form, this month Sir Paul releases his third experimental album of brand-new work under the alias The Fireman, with producer/musician Youth.